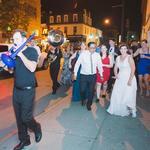 Music is a very important aspect of any wedding. It is the first impression your guests will have of the union between you and your fiancé at the ceremony, and it will set the tone at the reception for the rest of the evening. New Arts Ensembles can help customize your wedding music to fit your style and needs and are always available for individual consultation to design the perfect atmosphere for your special day.